Only six new books this week after a string of longer lists. The theme this time seems to be books I’ve fallen behind on. 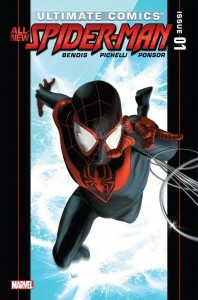 AMAZING SPIDER-MAN #686 – The Ends of the Earth storyline continues as Doctor Octopus threatens to destroy the world. I’m almost too embarrassed to tell you the last issue I’ve read of this series, yet I continue to buy it. AQUAMAN #9 – I’ve been less interested in this title after the first arc, but I’m sticking with it to see where Geoff Johns takes the secret history of Atlantis. ASTONISHING X-MEN #50 – This book is getting some mainstream attention with the announcement of Northstar’s wedding. I’m not sure if that will make it more difficult to find, but I know I have to read about eight issues to get caught up. 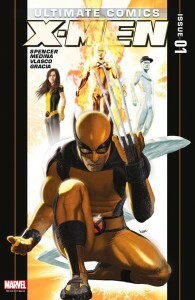 JOURNEY INTO MYSTERY #638 – Another chapter in the Exiled crossover with New Mutants. The weekly shipping schedule has taken me by surprise and there’s some catching up to do here as well. SECRET AVENGERS #27 – Captain Marvel returns! Again… I enjoyed the first part of this AvX tie-in, but I wasn’t crazy that the story spilled into Avengers #26 last week. I’m interested in what writer Rick Remender is doing with the title, so I won’t be going anywhere. Plus, this looks to be the story that will lead into Ms. Marvel‘s new series and that certainly has my interest. ULTIMATE COMICS X-MEN #12 – I don’t normally read this title (or any of Marvel’s Ultimate line), but is that Havok on the cover? With DC Comics’ “New 52” dominating comic shop shelves this month with more number one issues than any other time in history, other titles that are launching right now couldn’t have more competition for readers’ attention. This week, we’re going to try to shine a light on some other big titles that are launching this month, beginning with last week’s Ultimate Comics: Spider-Man #1 by Brian Bendis and Sara Pichelli. It’s part of an entirely revamped Ultimate line-up from Marvel, and as a jumping on point it’s hard to do better.